FRIDAY INSPIRATION: PINK HUED ROOMS! In honour of Valentine's day, it only seems fitting to share pretty and pink kids rooms today! I still love how we added an overall feeling of pink to Ella's toddler room just by adding accessories. The pattern in the pink hued rug below adds an eye catching element without overpowering the room. This bold floral wallpaper steals the show in the nursery below but the curtains and pillow add a perfect pairing too. Details, details, details! Just look at that custom tack board over the desk adding so much impact in a room just right for a little one and with so much room to grow. A little darker pink can work beautifully too as seen here paired with mustard yellow! The calm wallpaper is one of my favourites!!! 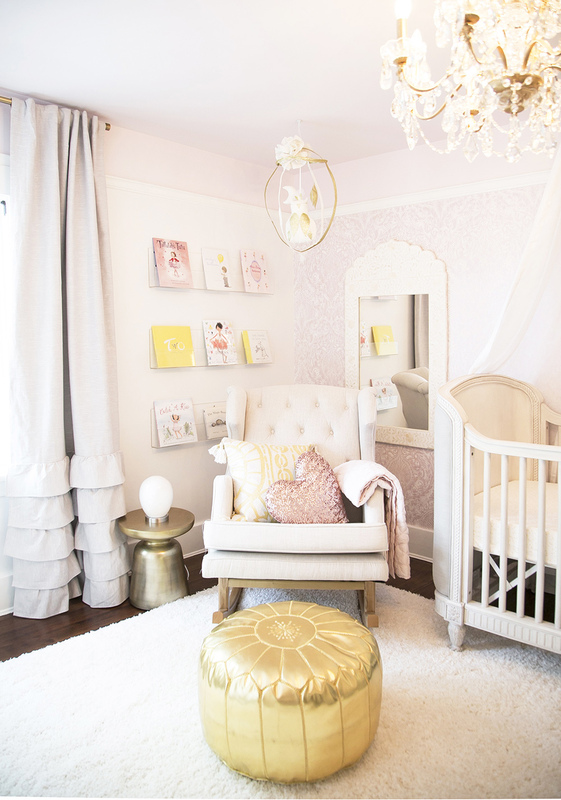 Pink and white with hints of yellow and a splash of gold, this baby girl nursery is light-filled and absolutely dreamy! I can't even begin to tell you how excited I am to share my newest project, little Nayviah's baby room with you all. Baby Nayviah's nursery is finished and it is pure bliss. Sweet little Nayviah was not yet here when we were dreaming up and creating the room she would come home to. This room had a black ceiling when I first saw it and right away I knew we wanted to brighten it up and make the most of the gorgeous Vancouver light when it shines. Nayviah's mom had two must-haves on her list: drapery over the crib and damask wallpaper. We worked together to choose the perfect paper and this one really has to be felt and seen up close to get the full effect; there is a shimmer to it that sparkles beautifully when the light shines. She was a dream client, loving what I presented and seeing my vision right from the start. The room is both airy and bright, soft and serene and the blackout curtains ensure that nap time and bedtime are dark (so important with tiny babes). Working with local artist, Dana Mooney, we created an Ikat on canvas that pulled the yellow, pink, off white and gold together. Nayviah has a toddler brother and I wanted to make sure that this space was a retreat for her, a place she could be rocked gently and read to away from the rest of the world. I just love how the book wall turned out with the Ubabub acrylic shelves and she is going to love peering into those mirrors to see her reflection as she grows. The mobile was custom made and sent from France from the sweetest handmade shop Creme Anglaise, and I have been eyeing it for ages waiting for the perfect space to place her work in. It's hard not to include at least a one of the Animal Print Shop art prints in a space for a little one and I just love how these two pair with the gold ottoman. I thought it would be fun to throw in a photo of what the space looked like the first time I saw it. It was a newly purchased home and a HUGE renovation happened throughout the house but this room remained intact. The wallpaper was the inspiration for the whole room and I love how it came together. Just walking in the room now feels completely fresh, airy, bright and serene. If you liked this reveal...you might like these ones too! Photography by Rebecca Dadson of Eye Compose Photography. Over the moon excited to share our newest project, ELLA'S ROOM! This room was created for a toddler girl and is bright and airy with touches of gold and rose quartz, Pantone's colour of 2016. Three-year-old Ella and her family had recently moved into a bigger home and were looking to have the room transformed from a baby nursery into a space that Ella could enjoy not only now as a toddler but somewhere special that could be used and loved for years to come. The overall goal was to create a bright, airy and whimsical space in soft pink, hints of grey and accents of gold - something completely dreamy! Starting with the Numero 74 canopy, the rest of the room took cues from there. The perfectly muted pink fabric is soft and forms a lovely little retreat for laying, reading and playing with friends. The gold stars add to the whimsical decor and tie in with the gold throughout. Keeping the crib from the nursery made sense, as it was easy to remove a side and convert the crib to a day bed. Lots of cushions and soft linens are fun for the day and so simple to remove for bedtime. Above the daybed are feather light angel wings that can come off for wearing or put back on the wall for display. Lucky little Ella loves dressing up so a sweet little dress up corner was created for her to hang her special dresses and fairy wings as well as house her growing collection of wands and accessories. She adores not only dressing herself, but also her stuffed animals. The sweet deer and cat are exquisitely handmade in Poland and found on Etsy. Ella loved them so much that more clothes for the animals were ordered for her to play dress up with. A lovely little DIY touch is the cloud shelves. Ella's mom found this idea and happily pitched in to create this special touch for her daughter. The rain hooks were painted to match with the Rose Quartz throughout the room and are great for hanging little jackets and purses at just the right height. The gold mirror adds a huge pop of glamour to the space and will easily grow with Ella and be used through the years to come. Looking through the mirror, you can see the angel wings and dreamy bedding. To keep the room looking as beautiful as when it is styled, sufficient storage was a must! Sweet Ella has lots of stuffed animals that she loves to pull out and play with. Thankfully, they can easily be tossed back into the baskets when it is time to clean up! With all the sweet details and special DIY touches, Ella's new room is now a gorgeous space for her to grow and create memories in. Love what you see? Find out how to get the look here!